The world of cinematography has changed more in the last few years than it has since it has in 1929, when sound recording was introduced. New technology, new tools and new methods have revolutionized the art and craft of telling stories visually. While some aspects of visual language, lighting and color are eternal, shooting methods, workflow and cameras have changed radically. Even experienced film artists have a need to update and review new methods and equipment. These change affect not only the director of photography but also the director, the camera assistants, gaffers, and digital imaging technicians. Cinematography: Theory and Practice covers both the artistry and craftsmanship of cinematography and visual storytelling. Few art forms are as tied to their tools and technology as is cinematography. Take your mastery of these new tools, techniques, and roles to the next level with this cutting-edge roadmap from author and filmmaker Blain Brown. 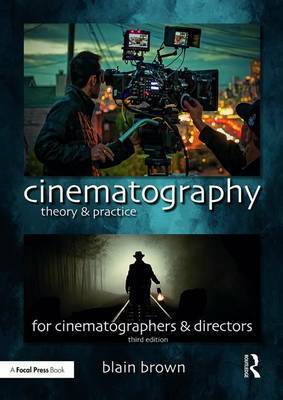 Whether you are a student of filmmaking, just breaking into the business, currently working in the industry and looking to move up to the next level, or an experienced professional who wants to update their knowledge of tools and techniques, this book provides both a basic introduction to these issues as well as more advanced and in-depth coverage of the subject. The companion website features additional material, including lighting demonstrations, basic methods of lighting, using diffusion and other topics.